I love browsing through recipes. More than 5 recipes for one kind of dish and then make my own blend.The same hold true for spice mixes. I love blending spices. A bit like planning an adventure. And you don’t simply walk into Mordor. No way. Mixing spices are witches’ area. I like being a witch. There were this ancient times when I put my trust in one recipe for one dish. It didn’t always spell disaster but in the end there were always this slight dissatisfaction on a missing link. Then I realize that the recipes were not to be blamed. It was my fault all along. I didn’t put my own taste and the taste culture of the intended diners to the equation. That’s the missing link. Now for this one, I stumbled upon an interestingly simple roast chicken recipe from Jamie Oliver here. So simple and for me, the taste would be so gorgeously simple too. But I knew my lunch congregation won’t appreciate it as it is so I decided to marinate the chicken in Cajun Spice Mix first. Turned out so lovely and so loved by all. Enjoy. Oh, I was cooking for 10 people so forgive the amount. Cajun Spice Roast Chicken: 2.5kg chicken wings and thighs, 3 large potatoes (peel and cut to 4-6 pieces each), 250gr cherry tomatoes, 4 garlic (chopped), juice of 1 lime, 4 oregano sprigs. Cajun spice: 1 tbsp salt, 2 tbsp paprika, 2 tbsp cayenne pepper, 2 tbsp garlic powder, 2 tbsp onion powder, 2 tbsp crushed black pepper, 1 tbsp mustard powder, 1 tbsp dry oregano, 1 tbsp dry thyme, 1 block chicken broth seasoning. Green oil: a large handful of oregano, olive oil, put in food processor or a blender and process until they become smooth and runny green oil. Spare a few sprig for roasting later. Marinade chicken with Cajun spices for at least 3 hr. 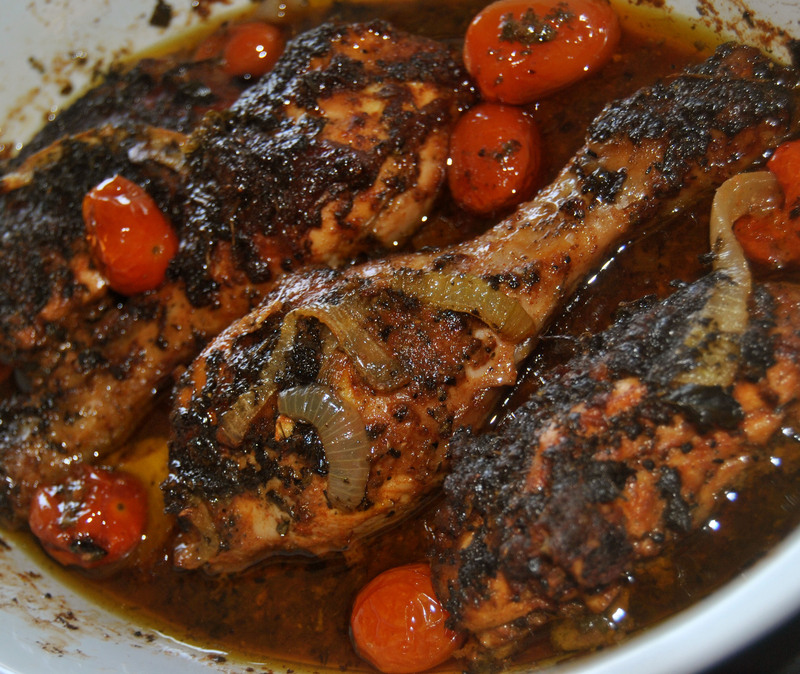 Brown chicken in 3 tbsp olive oil, add chopped garlic. Cook for a few minutes until all chicken brown nicely and the aromas meld. Boil or steam potatoes until semi-tender. Squeeze lime over chicken, mix well and remove from heat. Place the chicken, potatoes and cherry tomatoes in a baking dish, drizzle with green oil, and add oregano sprigs and mix. Bake for 45min-1 hour in 200°C or until all chicken done and the skin brown and crisp. Note: place chicken on large baking dish in one layer. If you pile them up you risk having undercooked chicken.